Joshua S. Coffey is a native of Boone, North Carolina who handles both civil and criminal litigation. 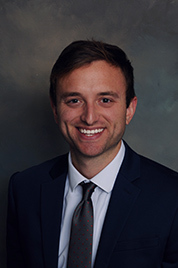 Josh has always enjoyed courtroom work, and devotes the majority of his practice to courtroom matters. Josh graduated from the Norman Adrian Wiggins School of Law at Campbell University after graduating from Appalachian State University with a degree in Political Science. He graduated from Watauga High School where he was captain of the basketball team. While in high school, Josh was appointed by the Honorable Congresswoman Virginia Foxx as a House of Representatives Republican Page for the 111th United States Congress. Josh served in this role in Washington, DC, and attended a portion of high school in the House of Representatives Page School located in the attic of the Library of Congress. He credits this experience with motivating him to pursue a career in law. Josh worked in Raleigh for the North Carolina Senate in the Office of former North Carolina Senator Dan Soucek in 2012, 2014, and 2015. While in law school, Josh focused his studies on trial advocacy. In 2015 he served as a legal extern for the North Carolina Department of Justice in its Tort Claims Division, where he assisted the Attorney General’s Office in defending tort claims against state agencies. In 2016 he served as a legal extern for the Watauga County District Attorney’s Office, where he prosecuted dozens of criminal trials under North Carolina’s third year practice rule. Josh was elected President of the Campbell Law School Republicans in 2016, and worked alongside the North Carolina Republican Party in its efforts in the 2016 election. Josh was also a member of the Campbell Law Federalist Society. Josh is a graduate of the Campbell University School of Law and Appalachian State University. During his time in law school, he worked for the North Carolina Department of Justice, the North Carolina General Assembly, and the Watauga County District Attorney’s office.